What is cotton made into? At the textile mill, the bales are opened by machines, and the lint is mixed and cleaned further by blowing and beating. The short lint that comes out usually is separated and sold for use in other industries. The best part of the lint consists of fibers about 1 inch to 1 ¾ inches long. The mixed and fluffed-up cotton goes into a carding machine which cleans the fibers some more and makes them lie side by side. The combing action of the carding machine finishes the job of cleaning and straightening the fibers, and makes them into a soft, untwisted rope called a sliver (pronounced sly-ver). On modern spinning frames, yarn is mare directly from the sliver. The spinning devices take fibers from the sliver and rotate it up to 2, 500 revolutions in a second twist that makes fibers into a yarn for weaving or knitting into fabrics. Machines called looms weave cotton yarns into fabrics the same way the first handweaving frames did. Modern looms work at great speeds, interlacing the length-wise yarns (warp) and the crosswise yarns (filling). The woven fabric, called gray goods, is sent to a finishing plant where it is bleached, pre-shrunk, dyed, printed and given a special finish before being made into clothing or products for the home. Other machines make knits for use in shirts, sweaters or blankets. 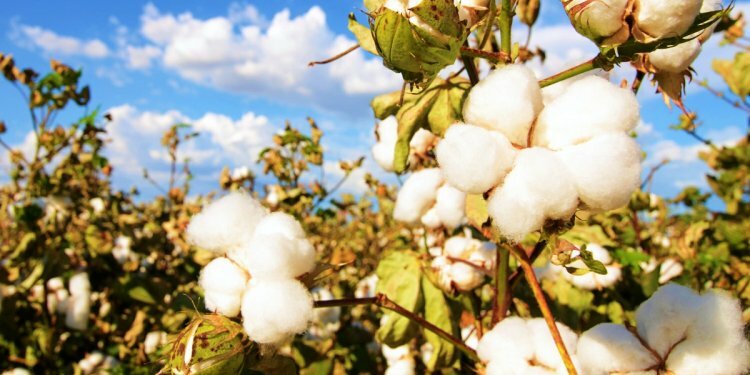 This, then, is the story of cotton – where and how it is grown, marketed, processed and manufactured into the many useful products that have served the world so well for so long. It is a never-ending story, as scientists continue to develop better ways to produce and use one of the world’s oldest fibers – cotton.